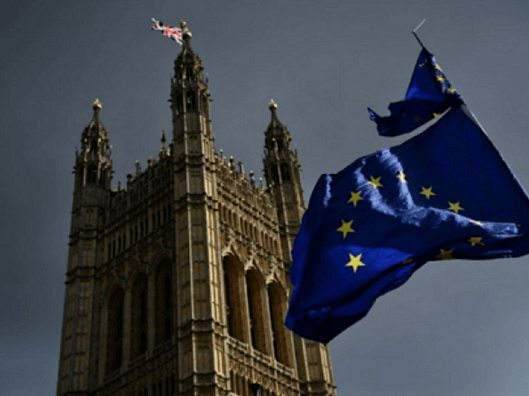 The Story of the First Brexiteer — And Now We’re Out… Again! Well, today is Brexit Day (again). Or is it really…? Seneca III has some remarks to make on the topic. Legend and history record that strange are the ways of the gods, and even stranger are the ways of men. In the year 286 AD, in the twilight of the Imperium, the once all-powerful Rome was on its last legs, as was its most western province, Romano-Britain. Together with Northern Gaul, Britain was seized by Marcus Aurelius Mausaeus Valerius Carausius, a military commander of the Empire and a Menapian from Belgic Gaul, who usurped the crown and declared himself Emperor (Imperium Britanniarum). He held power for seven years, fashioning the name “Emperor of the North” for himself, before being assassinated by his finance minister, Allectus. Carausius was of humble origin and had been appointed to command the Classis Britannica, a fleet based in the English Channel, with the responsibility of eliminating Frankish and Saxon pirates who had been raiding the coasts of Armorica and Belgica. He was suspected of allowing pirates to carry out raids and collect loot before attacking them, then keeping the captured treasure for himself, and Maximian ordered his execution. In late 286 or early 287 Carausius learned of this sentence and responded by declaring himself Emperor in Britain and northern Gaul. Maximian, Roman Emperor from 286 to 305, prepared an invasion of Britain in 288 or 289 to oust him, but it failed. A panegyric delivered to Constantius Chlorus attributes this failure to bad weather, but notes that Carausius claimed a military victory. Eutropius says that hostilities were in vain thanks to Carausius’s military skill, and peace was agreed. Carausius began to entertain visions of legitimacy and official recognition. 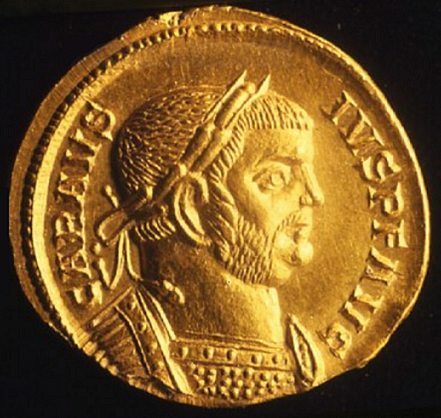 It is also notable that Carausius appears to have appealed to native British dissatisfaction with Roman rule; he issued coins with legends such as Restitutor Britanniae (Restorer of Britain) and Genius Britanniae (Spirit of Britain). Some of these silver coins bear the legend Expectate veni, “Come long-awaited one”, recognised to allude to a messianic line in the Aeneid by the Augustan poet Virgil, written more than 300 years previously. Allectus was Treasurer to Carausius. In 293 Carausius seemingly became isolated when the Western Caesar, Constantius Chlorus, later Emperor from 305 to 306, retook some of his Gallic territories, particularly the crucial port of Bononia (modern Boulogne), and defeated his Frankish allies in Batavia. Allectus then assassinated Carausius and assumed the mantle of Emperor of Imperium Britanniarum himself. 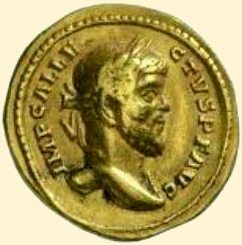 His [Allectus’s] reign has left little record, although his coin issues display a similar distribution to those of Carausius. They are often found in north-western Gaul, indicating that the recapture of Bononia did not spell the end of the rebel empire on that side of the English Channel. Constantius launched an invasion to depose Allectus in September 296. His forces sailed in several divisions. Constantius led one division from Bononia but seems to have been delayed by bad weather. Another division, under the praetorian prefect Asclepiodotus, took advantage of fog to avoid Allectus’s ships stationed on the Isle of Wight, and landed near Southampton Water, where they burnt their ships. Allectus’s forces were forced to retreat from the coast but were cut off by another of Constantius’s divisions and defeated. Allectus himself was killed in the battle, having removed all insignia in the hope that his body would not be identified. How little things change in the world of power politics. Could the story of Carausius and Allectus be a parable for our time? Well, in conclusion, I am of a mind that from one perspective Nigel Paul Farage might well be considered a metaphorical incarnation of Carausius, but I wonder who, from amongst all the usual suspects, bribing and juggling allies and backstabbing each other in an unsavoury feeding frenzy to replace May, will become his Allectus. …and will the part of the Western Caesar (and later Emperor), Constantius Chlorus, be played out by the EU perhaps in the person of a Macron or a Selmayer or an Annegret Kramp-Karrenbauer? Furthermore, in the future as things start to become even more politically chaotic, keep a very close eye on Phillip Anthony Hammond, current Chancellor of the Exchequer — he has an agenda all of his own. Nevertheless and without doubt the coming months and years will reveal all. Do bear in mind that the Globalist cartel has not been destroyed; it has simply lost a major campaign, and will come back again from another direction if the other once-sovereign nations of Europe do not soon take their destiny back into their own hands and commit the memory of the malignant EU to but a few pages in the history books. May their future politicians read those pages every morning before going about their work on behalf of the people who elected them. Strange indeed are the ways of men… and women, so thank you Gina Miller and I do hope your ‘investment’ decisions have a sounder moral foundation than the motivations behind your attempt to thwart the will and aspirations of the people of your adopted country. But yet, despite all the contrary machinations such as Project Fear and the activities of the likes of Miller, Branson, the EU and the rest of the international money-grubbing fraternity, we have cleanly left the European Union without any so called ‘Deal’ and are now able to carve our own path and determine our own future for the first time in two generations irrespective of the desperate, ill-informed caterwauling of those who have never before experienced the challenges, the disappointments and the always-substantial rewards of real independence. Seneca III — at 2301 hours BST in a now sovereign United Kingdom, this glorious 12th of April 2019. 1. Gina Nadira Miller (née Singh) is a British Guiana-born businesswoman and owner of a company involved in ‘Investment Management’. She is also a political activist who initiated the 2016 R (Miller) v Secretary of State for Exiting the European Union court case against the British government over its authority to implement Brexit without approval from Parliament. Miller is an ardent Remainer and one has to assume that she thought Theresa May was actually going to keep her word and take us out — foolish child. However, the best-laid plans of mice and men often backfire, and by handing authority to Parliament to determine the process, she made Remain impossible, because that arrogant and constitutionally corrupted Legislature could not find a way to approve May’s persistently presented surrender document farcically known as the Withdrawal Agreement, nor agree on anything else other than a substantial pay rise for themselves. For links to previous essays by Seneca III, see the Seneca III Archives. This entry was posted in Civil Liberties, Crazy Socialism, Economics, Europe, History, Legal action, News, PC/MC, Politics, Stupidity, Treason, UK by Baron Bodissey. Bookmark the permalink. Is England really out of the European Union?? Why hasn’t there been any news of this. I have four different news sources and I haven’t heard a thing. acuara- I too am trying to figure this out as it is very puzzling. On the one hand there is the Requiem for Britain and then this article. My best guess is that there has been no Brexit and probably there won’t be in our lifetime. If things have changed overnight, let me be the first to congratulate the good people of the UK but somehow I doubt it. There’s a little bit of confusion here. I sent both to the Baron early last week so that the relevant one could be posted at 2301 hours on the 12th. Seems we now have both but only the Requiem applies. Still, the other one was a comforting thought for me, and perhaps one day…? We’re definately still in, acuara, and the chaos, double dealing, lying and outright treason continues on its course. Apologies for confusing you all. Let’s consider the first post an “alternate history”, shall we — a might-have-been. I was massively confused by the whole Brexit process, and still am. None of it makes any sense — an endless series of votes in the Commons, the role of the Lords and Her Majesty, Brussels’ responses. It’s a real mare’s nest, as far as I’m concerned. No wonder I didn’t understand what I was to do with those posts! No sweat, Baron, it’s the intellectual twilight of the Gods in Westminster and Brussels. The Powers That Be do not want Brexit. This is just a long drawn out dog and pony show. 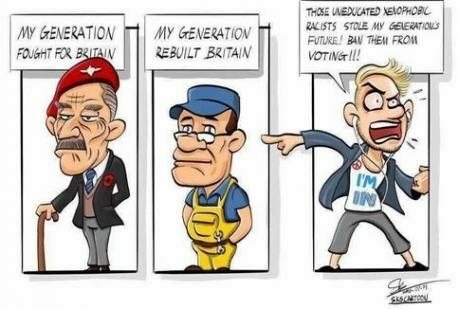 England is gone, has been for decades. I’d vote for Pooh! He may be a Bear of Little Brain, but he seems incapable of malice.